– She’s an old wheel and not readily available. I’ve had my eye out for one for a good while and scored this one on eBay. Aw, she’s lovely, isn’t she? I don’t know a whole lot about these wheels, other than that they were made in New Zealand on a small scale between 1962 and 1982. I’ve seen photos of other Wendys with slightly more sophisticated-looking wood-turning, so my guess is this one’s an earlier model. Since this is an old wheel, I will tell you my experience with this particular specimen. This wheel has some serious dings and came to me in a pretty filthy state. There’s been some cleaning, some gluing, the addition of some leather washers Mr. HelloYarn made to keep the bolts from marring the wood further, and some oiling and waxing, but it didn’t take anything else to get her to spin like a top. It is a pleasure to use in addition to being so stinking cute I could scream. 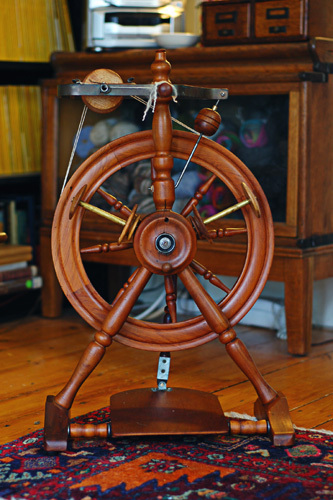 This is a sturdy, solid wood wheel that, despite its small size, stands solidly when spun on. Everything about this wheel seems pretty normal until you get to the flyer. It’s held in a metal frame that pivots on a brass rod, allowing tensioning of the double drive system by the turning of a wooden knob. This changes the height of the orifice, but it hasn’t been a problem for me. I’ve found the knob to be very handy and the tensioning to be responsive. The front maiden supports a metal bearing that’s built around the orifice, which isn’t something I’ve ever seen before. ONce thoroughly oiled, it turned freely. The whorl is solid wood and fits onto the steel flyer spindle, staying put with 2 notches fitting over two flanges. I would think this is excellent news for someone who wants to make new faster or slower whorls. There aren’t any machined metal parts to match. The wheel treadles nicely, due in part to weights embedded in the rim of the drive wheel. I don’t know if someone added these or if they were built this way, but they really get rid of that dead spot. Despite being older and small, this would make a great basic wheel for someone. The ratios are middle-of-the-road, the tensioning isn’t fiddly, and it treadles well. I wouldn’t hesitate to buy it again. This particular wheel isn’t readily available, so the info contained in this review isn’t going to come in handy for many, but there’s so little online about these that I figured someone would be happy to read this someday. If you have a Pipy, I’d love to hear about it and talk wheels. Very cool! I saw one of these at the Topsfield Fair spinning bee back in October, it was very cute – hadn’t seen one before. Great review! Where did you find it? It’s SOOO freakin cute! And the wood is gorgeous. Adorable, Adrian. I am curious about how it came to you. I don’t understand 1/2 of what you write but it is a lovely piece. Oh, cute! :-) I hope you have a lovely time getting to know her. I also own a Wendy with scotch tension. She is one of my favorite wheels. Three whorls came with her so I have many ratios to spin with. This wheel is a cute, hardworker. Wow, Your wheel is really gorgeous. That is simply adorable! I have such a weakness for useable collectibles. I couldn’t walk away from my clemes and clemes once I’d tried it, and I’d never be able to walk away from that little darling either, nice find! I hope I do not run into one soon, because I just purchased my third wheel (not that I needed it, but I did not have a Nordic wheel yet) and would be tempted to adopt such a lovely one instantly.